We returned: ten elated NSAS birders, having withstood heavy rains, winds that toppled tractor trailers, and sand storms: we returned elated and visually sated. 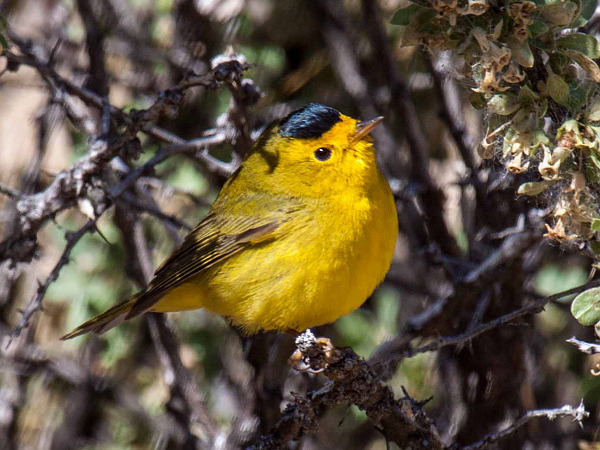 Yellow-breasted Chat, White-faced ibis, Western Tanager and Cactus Wren were some of the favorite sightings among the many species recorded during our 2 1/2 day trip. We all wished it had been longer. Several participants made that happen by arriving a few days early. That was a great idea! Our first morning we were off to Butterbredt Spring, a famous high desert "migrant trap" that offers food and water to birds coming north from Mexico and further south. On this particular morning the small patch of trees also provided shelter from gusty winds--for both us and the perhaps some of the birds. The bird density and diversity was great and we never tired of the continuous flow of migrants and residents. Highlights, in addition to the chat: Green-tailed Towhee, Costa's Hummingbird, Calliope Hummingbird, Ladder-backed Woodpecker and Lazuli Bunting. Being at eye-level and thirty feet from a posing Hammond's Flycatcher was a once-in-a-lifetime experience. I think we all could have spent the whole day at Butterbredt, but the LeConte's Thrasher was waiting for us at a 40 acre oasis/residence in the middle of a creosote desert. Over two visits, we all got great views of this stunning bird. Bob Barnes could not have been more proficient in leading us to the birds. 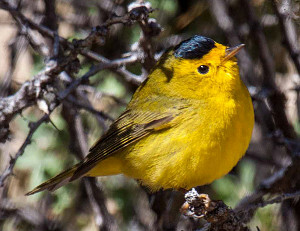 For example, on the second day he took us to Chimney Peak Road, successfully locating 3 specific birds: Scott's Oriole, Black-throated Sparrow, and Cactus Wren. 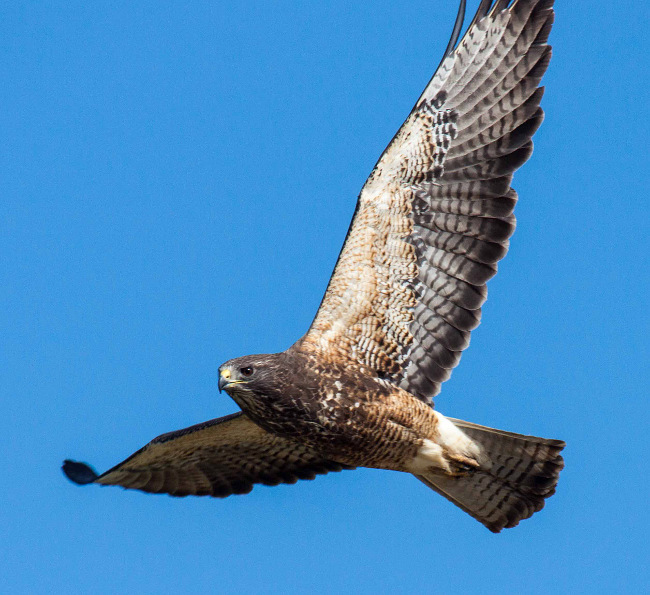 Seeing these three desert-specialty birds atop Joshua Trees was exhilarating! Bob and Kim Kuska enriched our viewing with context on the "whys and hows" of migration; how agricultural expansion has blocked the thrasher from much of it's previous habitat; the historical near-extinction of the Cackling Goose that we viewed at close range; how Bob and dedicated environmentalists saved the one mile wide by fourteen mile long Kern River Preserve; and Kim's ongoing battle to save from extinction Dudley�s lousewort, a lime green, fern-like hemiparasitic plant found growing at the base of Douglas Fir trees. If this plant disappears, the impact to the entire forest ecosystem could be dramatic. We all could feel the passion of these two dedicated environmentalists; their stories took our trip to a higher level and we thank them for that! Most of the group was able to stay for the final half day when we moved to the other side of enormous Kern county. In Bakersfield, we stopped at Beale Park and added Spotted Dove and Rose-collared Parakeets to the trip list. Our last big stop was Kern National Wildlife Refuge north of Bakersfield: Enough water for ducks, ibis, yellowlegs, yellowthroats, and sora calling (Virginia Rail with "rail-lets" had been seen here recently). Water birds were everywhere--a great conclusion to the trip. Thanks to all the trip participants! We had lots of eyes on the birds, and lots of friendly help describing where to look to see the birds that were hard to spot. The spotting scopes were a big help and readily shared, for example giving us an unforgettable view of a yellow-headed blackbird, during a brief period of gale-force wind, riding the cattails like a cowboy on a bronco. Yahoo! Belted Kingfisher 1 adult female. 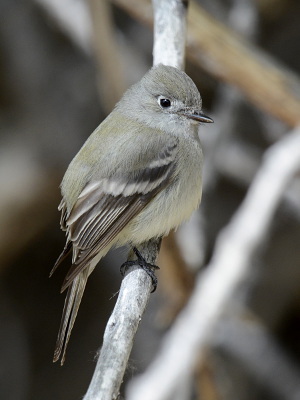 Gray Flycatcher 1 NOTE: Photo by Michael Moshier. Cliff Swallow 300 at least three colony sites. Scott's Oriole 4 all males. This weekend field trip will be offered to 'NSAS Chapter members only' and will require a modest donation from each attendee--the actual amount will be determined by number of participants. Maximum number of participants has been set at 12. Please 'RSVP' early to ensure your participation. Final confirmation & deposit of $25 required by April 1, 2014. Saturday, April 26, 2014 - Butterbredt Spring, Inyokern and Ridgecrest desert oases. Dinner & Night in Ridgecrest. Sunday, April 27, 2014 - Inyokern Middlemiss and Inyokern Steele private property oases, Kern River Valley. Dinner & Night in Bakersfield for those who choose to stay over. 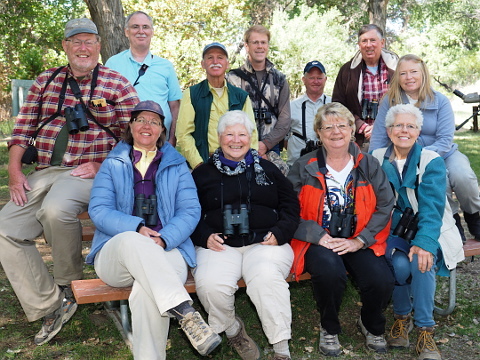 Monday, April 28, 2014 - Morning Birding Option with Bob Barnes will take those who wish to look for countable Spotted Dove at nearby Beale Park. Then we will drive north and west to bird Kern National Wildlife Refuge until Noon or so. Travel homeward at time of your own choosing. Please RSVP to Field trip Co-Chairs Wendy Cole or Bruce Thomsen. Lodging recommendations & further details will be provided once you have reserved as a participant.